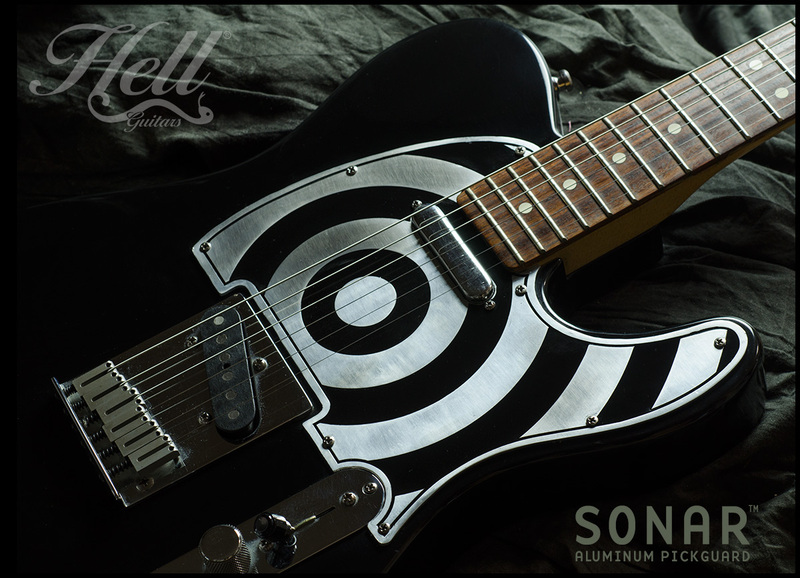 From Hell to you…Sonar All-Aluminum pickguard! | machinehead! Here’s our first prototype for a new pickguard for Tele-style guitars. Made of aluminum to keep it light and to help shield your guitar from that nasty RF buzz. Once we’ve nailed a proper production guard we will be manufacturing a bunch of styles to be followed by guards for Strats, LPs, SGs and perhaps some Gretsch models. The guard pictured above is on my ’93 American Standard. Looks stunning if I do say so myself. A side note about my Tele. It has been very stupidly left unstrung, without case and kept in a room with very high temps and humidity (in summertime) for the past 2-3 years. I was using it to fit different pickguard designs and couldn’t be bothered to string it back up and put it away. Well, when I fit this guard on it, I finally decided to string it up figuring that the neck will have probably warped beyond playability. Amazingly it is the same great neck that it always was. It plays (and sounds) faboso. To be honest, this Tele was always a special one to me so I’m not sure how I could have neglected it so but after all, no harm done. Anyway, please stay tuned for some amazing pickguards that you will not be finding anywhere else. In fact a ton of new products are set to be released– starting very soon! This entry was posted in Gear, Guitars, Hell News. Bookmark the permalink.